"If somebody tells you the cat is still breathing and it's alive, the cat shouldn't have been buried." The lives of just about all cats are not only terribly brief but filled with all sorts of unspeakable deprivations and abuse. As such, their lots in life can only be described as outrageously unjust. 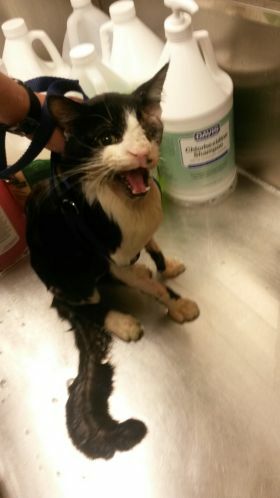 The gauntlet of horrific abuse and abject neglect that a handsome tuxedo named Bart was put through back in January of 2015 almost defies credulity, however, and that alone places his seemingly interminable suffering in a class all by itself. 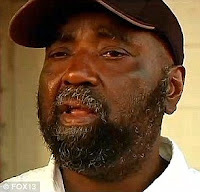 His tribulations began on January 16th when he was run down and left for dead in a pool of blood smack-dab in the middle of East One-Hundred-Thirteenth Avenue in Tampa. That sans doute intentional assault upon a defenseless cat by yet still another hit-and-run motorist occurred less than a block from the house that he had shared with fifty-three-year-old Ellis Hutson at 822 East One-Hundred-Twelfth Avenue ever since his birth in a dresser drawer eighteen months previously. What transpired next remains a bone of contention to this very day. For instance Hutson's girlfriend, Candice Mclendon, claims to have retrieved Bart from the avenue and to subsequently have returned him to his owner. Instead of procuring emergency veterinary assistance for his badly injured cat, Hutson instead gave him to a neighbor identified in press reports only by his first name as Dave with instructions to bury him. "He was very dead," forty-two-year-old Dusty Albritton, another neighbor of Hutson's, averred to the Tampa Bay Times on January 28, 2015. 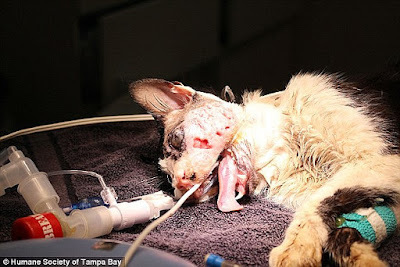 (See "Full Recovery Expected for Tampa 'Zombie Cat'.") "He was stiff. He was cold." Yet in a video later posted on YouTube by none other than Albritton herself, Mclendon can be heard off-camera telling an entirely different story. "He might not have been dead," she declares according to the Tampa Bay Times' February 11, 2015 edition. (See "'Zombie Cat' Owner Suing Tampa Humane Society for Custody.") "Cause when I found him...he was moving and stuff." In the uproar that soon followed Hutson, for whatever it is worth, claimed not only that it was he who had found Bart but that Mclendon was not even present. She was proven to have been right, however, when Bart amazingly showed up very much alive at Hutson's house, allegedly five days later on January 21st. "It was unbelievable," he swore to the Daily Mail on February 11, 2015. (See "Catnapped? 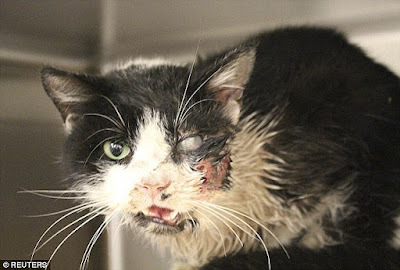 Owner of Bart the 'Zombie Cat' Sues Humane Society, Alleging It Stole His Beloved Pet and Is Using Him for Publicity.") "I've never seen anything like that before." Bart may have been alive but he also was hungry, dehydrated and, understandably, disheveled. 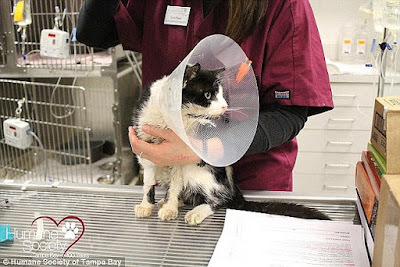 This time around Hutson did what he should have done five days earlier and that was to take him to the Humane Society of Tampa Bay (HSTB) for emergency veterinary treatment of the life-threatening injuries that he had sustained at the hands of the criminal motorist. Unlike most mercenary rescue groups and veterinarians who will not lift so much as a lousy finger in order to save the lives of injured and ailing cats unless they are paid in full and up front, the HSTB used its Save-A-Pet Medical Fund in order to provide emergency care for Bart. It did, however, insist that Hutson take financial responsibility for Bart's long-term care and in furtherance of that objective it worked out an arrangement for him to pay on time. Once the wrangling over money had been settled, the HSTB finally got around to the herculean task of attending to Bart's massive injuries. Specifically, his left eye had been ruptured, his jaw broken, and he had sustained multiple lacerations and contusions to his face and perhaps elsewhere as well. 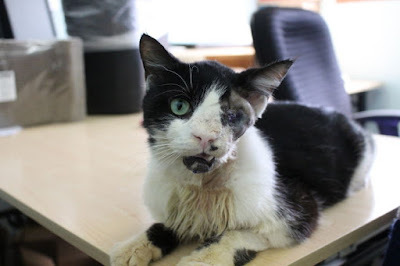 Even though the more than one-thousand dollars' worth of emergency veterinary care that Bart so desperately needed and richly deserved came eleven days after he was injured, late proved to have been better than never at all in this instance because it enabled him not only to survive but to eventually reclaim a semblance of his former life. "He's purring, even with all those injuries," Sherry Silk of the charity told the Daily Mail. "I can't even imagine how awful he must have felt. He's just a really wonderful, patient, loving cat." Even still there cannot be any denying that he was put through pure Hell. Bloody, bruised, and with only one good eye and a broken jaw, he was unable to eat even if he had been lucky enough to have stumbled upon some food. Although it undoubtedly was an extremely painful exercise, he nevertheless likely was able to have licked up some condensation and possibly even a little rain water so as to have prevented his kidneys from locking up on him. Also, his open and untreated wounds easily could have become infected and his debilitated state made him easy prey for ailurophobes, other animals, and yet still another scum-of-the-earth motorist. On top of all of that, he not only easily could have suffocated to death in his premature crypt but he also had to somehow summon the strength needed in order to dig himself out from underneath all the dirt and other assorted debris that had been piled on top of him. In that regard, the only factor that he had going for himself was that his impromptu final resting place was a shallow one located alongside the avenue. Nevertheless, the unrelenting pain must have been almost unbearable and the hopelessness of his plight surely would have defeated any soul less determined to have survived. Under such trying conditions, it is remarkable that he still was able to summon the physical and mental resources required in order to have found his way home. That at least is the official version of events disseminated to the public by the HSTB. Upon reflection, however, it bears a far closer resemblance to a Märchen than it does the truth. Most perplexing of all, the HSTB has not even bothered to publicly speculate on where he was and what he was doing between January 16th and January 21st. Above all, it seems highly improbable that he spent that length of time underground and then suddenly extricated himself after miraculously reviving. A far more plausible explanation is that Bart came to shortly after he was placed in the ground and then clawed his way out from underneath the dirt and back to the world of the living. It also is entirely conceivable that someone, possibly either Mclendon or a passerby, dug him out but, like Hutson himself, was too uncaring to summon veterinary assistance for him. Following that, he likely found his way back home where Hutson unpardonably stood idly by and watched him suffer in excruciating pain for five days before finally deciding to transport him to the HSTB. That analysis of what transpired is, admittedly, purely speculative but it is about all that the public has to go on given that neither Hutson, Mclendon, nor Albritton are ever about to come clean. Additionally, the thoroughly disreputable capitalist media have failed once again to show any interest whatsoever in getting to the bottom of another simply horrendous case of cruelty directed at a cat. Instead, these sorry excuses for both journalists and human beings have contented themselves by disparaging Bart as a "zombie cat" and drawing unflattering analogies between him and another tragic feline named Church from out of the pages of Stephen King's 1983 novel, Pet Sematary. The only recent incident of this kind that readily comes to mind concerned a petit black female named Muffin from the St. Louis suburb of St. Jacob who was condemned by her owner, Sarah McCallum, to spend three and one-half hours underground in April of 2013. Alleging that she was cold, not breathing, and lacked a discernible heartbeat, she precipitately stuffed her into a small box and then buried her in a field outside her house. In all likelihood Muffin soon would have suffocated to death if McCallum's six-year-old son, Bradley, had not requested and received permission to plant a flower on her grave after learning of her demise upon his return from school. While he was doing so, Muffin meowed and that proved to have been her salvation. Taken to a nearby veterinarian, she was pronounced to be in perfect health. The only explanation subsequently offered by the practitioner was that she likely had suffered some sort of a seizure and afterwards gone into a brief coma. Besides the obvious fact that the overwhelming majority of all shelters and veterinary offices function as little more than thinly disguised feline liquidation services and as a result could care less how many of their victims that they bury alive, the act of departing this vale of tears apparently takes considerably longer than previously believed. Although there has not been, as far as it is known, any research conducted on exactly how long it takes a cat to die, some anecdotal studies have suggested that it can take some humans as long as three hours to completely expire. Consequently, a radical rethinking of these all-important issues is in order. That is imperative not only in order to safeguard the sanctity of all life but to alleviate unnecessary and prolonged suffering as well. In a world that has become dreadfully overcrowded, there is not as much interest in this issue nowadays but that was not always the case. For example, in his 1975 historical novel, The Great Train Robbery, Michael Crichton argues that some inhabitants of Victorian England were so frightened of being buried alive that they instructed their morticians to lay out their mortal remains in coffins that were fitted with bells attached to cords that they could avail themselves of should they unexpectedly revive before being interred. Following surgery, Bart was placed on a healing and rehabilitation regimen that was expected to have lasted for six weeks. Once he had completed that, the HSTB initially planned on returning him to Hutson. "I have every indication that his owner is going to be able to come back and forth for follow-up care," Silk declared to the Tampa Bay Times in the January 28, 2015 article cited supra. "The main thing is we want him to stay inside, safe and sound." A few days later, however, the organization did an abrupt about-face and struck up a new tune. "Recently we have learned new information about Bart's home environment and the circumstances leading up to his burial. Therefore, the HSTB does not intend to return Bart to the Hutson family," the Daily Mail reported it as announcing in the February 11, 2015 article cited supra. "We are prepared to fight for the best interests of this cat. We hope the Hutson family will do the right thing and surrender Bart to our care so that we can find an appropriate environment for him to live out his life." Although the HSTB has not explicitly spelled out its reasons for taking that extraordinary action, it certainly by that time had amassed enough incriminating evidence against Hutson for doing so. First of all, even though he earlier had agreed to confine Bart indoors, the charity may have doubted his resolve on that issue. Secondly, the organization did not want his daughter pestering him while he recuperated. "She's a typical two-year-old," Silk told the Daily Mail. "We want a home with no young children that could put him in jeopardy." 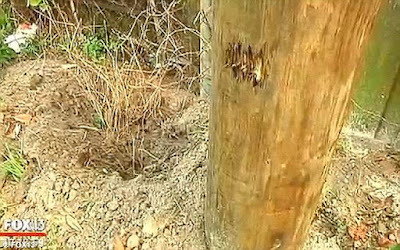 The deciding factor, however, was undoubtedly his unforgivable decision to have buried him alive. Plus, his dillydallying for five days before seeking emergency veterinary care for him most assuredly did not help his case. "If somebody tells you the cat is still breathing and it's alive, the cat shouldn't have been buried," Silk told the Daily Mail. "I don't know if it was purposeful, but we are not going to return the cat to him." That still does not completely explain the HSTB's change of heart. "They've known about the video from day one," Hutson retorted to the Tampa Bay Times on February 11, 2015. Whereas it is always conceivable that a staffer may have taken a shine to Bart and therefore was unwilling to relinquish custody of him, such occurrences are uncommonly rare. On the contrary, it usually is precisely the exact opposite that holds true in that most shelters are so inundated with cats that they cannot get rid of them fast enough even if that means exterminating them en masse. Not about to sit idly by while the HSTB confiscated his cat, Hutson immediately vowed to fight. "If we have to go to court, we have to go to court," he vowed to the Daily Mail. "I haven't done anything wrong, and I don't think it's right to take my cat." True to his word, he filed suit against the HSTB in the Circuit Court of Hillsborough County on February 9, 2015 demanding that Bart be returned to him. In doing so, he elected to proceed in forma pauperis so as to obtain free legal assistance. Online court records of the case, Hutson v Silk, number 15-CC-004347, indicate that he later was represented by Melissa Ann Cordon but they fail to specify if she was appointed by the court. Local attorney Thomas Gonzales volunteered his skills for the HSTB. The mere fact that Hutson was either unable or unwilling to hire an attorney to represent him lends credence to the theory that money, not overwhelming grief as he earlier had maintained, was the principal reason behind his abhorrent decision to have had Bart buried as opposed to treated. Of course, it is always conceivable that he simply is too cheap to spend any money on either his cat or a lawyer. Even his lawsuit appears au premier coup d'oeil to have been motivated more by financial considerations than any genuine love for his resident feline. Specifically, he alleged that the HSTB was "keeping Bart for publicity to raise money for the organization." Although it is by no means unheard of for some rescue groups to engage in such dishonest behavior, absolutely no evidence has come to light that would tend to indicate that was the case with the HSTB. In fact, the opposite appears to have been the reality in that it was on the hook not only for the cost of Bart's various surgeries but his extended convalescence and maintenance throughout this protracted legal process. Moreover, such an accusation just as easily could be turned around and leveled against Hutson even though there likewise is not a speck of evidence that he was planning on exploiting Bart's newfound notoriety for personal financial gain. Nevertheless, it is entirely possible that whichever side that came out on top in this legal squabble could have eventually reaped a financial bonanza in terms of book, movie, and television contracts as well as earnings from personal appearance made by Bart. To only person known to so far have made any money off of Bart's suffering has been Albritton who raised nearly US$7,000 on his behalf at gofundme.com. Other than informing the Tampa Bay Times on February 11, 2015 that all of the funds were earmarked for Bart's care, as opposed to Hutson's legal bills, she has not publicly specified exactly how that they were spent. As is the case with just about all litigation, the wheels of justice grind every bit as agonizingly slow for cats as they do for humans and it accordingly was not until August 30th of this year that Judge M. Darryl Manning dismissed Hutson's lawsuit for a "lack of prosecution" and thusly awarded custody of Bart to the HSTB. Since he has not publicly commented on the court's decision, it is not known specifically why that he chose to throw in the towel but it is suspected that his lack of money may have factored heavily into that momentous decision. Exactly where Bart spent that long interval has not been disclosed but presumably he was residing at either the HSTB or in foster care with a staffer. The latter would seem to have been more likely in that an anonymous longtime staffer was awarded custody of him on September 14th. That truly blessed individual, who beat out more than one-hundred competitors for that singular honor, has chosen to remain anonymous out of fear of retaliation from Hutson and his cronies. That would appear to be a valid concern in that the organization has received at least one telephone threat to "storm" its offices and to catnap Bart. Needless to say, being subjected to additional violence was the absolute last thing in this world that he needed during his long and, at times, difficult, convalescence. 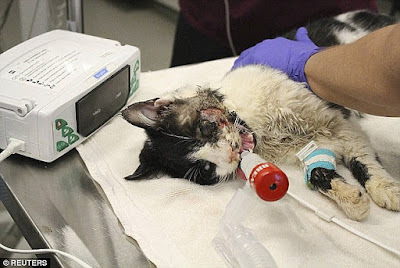 "This cat had a will to live. He was not going down without a fight," Nash McCutchen of the HSTB declared to the Tampa Bay Times on September 14, 2016. 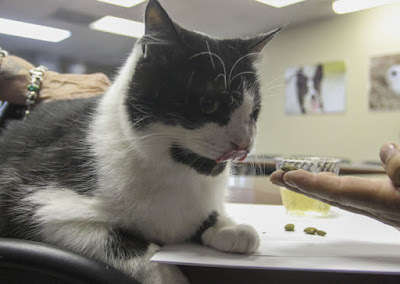 (See "Bart the Zombie Cat Has New Owner Following Lengthy Legal Battle.") "He was depressed, couldn't eat well and a lot of other animals may have just given up. He didn't." Even though he cannot help drooling when he eats, Bart's recovery has been nothing short of spectacular. In particular he has learned to eat so well with his reconstructed jaw that his weight has doubled from seven to fourteen pounds. "Now he actually eats too much, McCutchen added. "He's a little chubby." Perhaps even more important than that, he appears to have conquered his depression and once again enjoys playing. It has not been disclosed but hopefully he also is pain-free. Whereas allowing one of its staffers to adopt him augurs well for Bart's short-term care in that he will enjoy unfettered access to topnotch veterinary care, the HSTB's abiding love affair with killing cats may ultimately be his undoing. "Euthanasia is a humane way of ending the life of an animal who is suffering from chronic illness, irreparable injury or old age. Euthanasia is not painful to pets but is simply a sensation of falling into a deep, restful sleep," the organization dishonestly carols on its web site. "We offer a peaceful, private environment where our caring and certified euthanasia staff will help you, your pet and your family through the process." The objections that can be raised to such outrageous balderdash are myriad. First of all, killing cats and other animals under any circumstances is patently immoral and tantamount to the commission of first-degree murders. Despite all of its insanely egotistical protestations to the contrary, absolutely no one has anointed the HSTB with the moral prerogative to commit wholesale murders. Secondly, chronic diseases and old age are not, as the HSTB falsely claims, valid reasons for killing cats. Thirdly, even what it labels as "irreparable injuries" are little more than matters of opinion that most often are resolved by considerations of money and convenience as opposed to the application of sound principles of veterinary medicine. Fourthly, it is utterly disgraceful that the HSTB is so money mad that it has chosen to line its pockets with the blood of cats and other animals that it systematically exterminates. Fifthly, it is not only guilty of corrupting and misapplying the odious practice of euthanasia to nonconsenting animals when it should be explicitly reserved for the sole use of consenting adults, but it also is operating a slaughterhouse in the guise of a humane society. For instance as of October 1st, it claims on its web site to have saved five-thousand-nine-hundred-eighty-six animals so far this year and that equates to a save rate of ninety-one per cent. That alone means that it admittedly has killed off at least nine per cent of the animals, most likely predominantly cats, that have passed through its portals. The toll could be even higher in that it does not specify either if owner-requested killings are included in that tally or exactly how many animals that it has impounded. It furthermore claims on its web site to have treated twenty-nine-thousand-seven-hundred-seventeen animals during the first nine months of this year but that is a meaningless statistic without it first divulging not only how many that it has killed through sheer incompetence but, more importantly, the number that it has condemned to premature deaths, not to mention unimaginable suffering, all because their owners were too poor to pony up for their treatment. On the positive side of the ledger, it claims to have performed nearly three-thousand low-cost sterilizations and to be a proponent of TNR. In the final analysis, however, its appalling disrespect for the sanctity of feline life coupled with its blatant obfuscation of the truth do not bode well for Bart's prospects. That is because his new guardian, long indoctrinated into the commission of such heinous crimes, is unlikely to even think so much as twice about prematurely snuffing out Bart's life whenever he gets either sick or simply grows old. In at least that one respect he may have fared better if he had remained with Hutson in that it is a foregone conclusion that anyone unwilling to pay for the treatment of a badly-injured cat is not about to fork over good shekels to either a pack of remorseless killers, such as the HSTB, or to some unscrupulous veterinarian in order to have one whacked. There are not many advantages associated with being relegated to the ranks of the impecunious but the inability to afford to pay unprincipled individuals and institutions to kill off cats is certainly one of the unheralded ones. Besides, money and the power that it bestows upon its possessors are far more often than not used only for baseless self-indulgence and the commission of evil deeds. "Looky here, Tom, being rich ain't what it's cracked up to be," newly flush Huckleberry Finn declared in Mark Twain's 1876 novel, The Adventures of Tom Sawyer. "It's just worry and worry, and sweat and sweat, and a-wishing you was dead all the time." Regardless of either how his life unfolds or ends, the world in all likelihood has heard and seen the very last of long-suffering and horribly abused Bart. All that there accordingly is left to do is to celebrate his triumph over outrageous misfortune and his indomitable will to live. Sadly, he is destined to carry with him for as long as he lives the scars and disabilities inflicted upon him by that diabolical monster known as man. Needless to say, the motorist who came within a hairbreadth of killing him never was apprehended; even more deplorably, the authorities never even bothered to so much as open an investigation into the matter. Hutson likewise never will be punished for either burying him alive or allowing him to suffer so piteously for such a long time before finally deciding to have him treated. Regardless of how that what was done to Bart is added up it still comes out to being appalling unjust. Even worse, once his new guardian and the HSTB decide to prematurely snuff out his life that, too, will be every bit as unfair no matter how strenuously they attempt to sugar-coat and spin it. Photos: Reuters (Bart's injured face and him with a feeding tube), Fox-13 of Tampa (Bart's grave and Hutson), the Humane Society of Tampa Bay (Bart following surgery and in an Elizabethan collar), and Andrea Leiva of the Tampa Bay Times (Bart eating, exclaiming, and today).